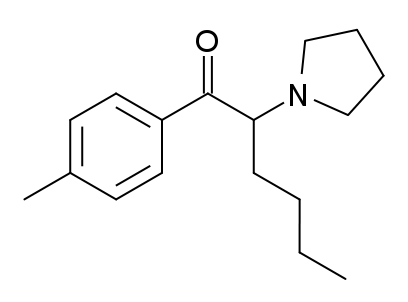 MPHP or 4′-Methyl-α-pyrrolidinohexiophenone is a stimulant compound which has been reported as a novel designer drug.It is closely related to pyrovalerone, being simply its chain-lengthened homologue. In the pyrrolidinophenone series, stimulant activity is maintained so long as the positions of the aryl, ketone and pyrrolidinyl groups are held constant, while the alkyl backbone can be varied anywhere between three and as many as seven carbons, with highest potency usually seen with the pentyl or isohexyl backbone, and a variety of substituents are tolerated on the aromatic ring.In 2010 a group of researchers from the Institute of Forensic Medicine, University Hospital Jena, Germany concluded that MPHP can lead to serious poisoning with toxic liver damage and rhabdomyolysis. The toxicological detection of the new synthetic cathinone 4′-methyl-α-pyrrolidinohexanophenone (MPHP) in urine samples has been impossible, because much of MPHP is metabolized before its excretion into urine. In this study, we successfully quantified unmetabolized MPHP in urine of an autopsy case using a sensitive method by liquid chromatography–time-of-flight-mass spectrometry. The quantification method showed good linearity in the range of 1.00–100 ng/mL, and the limit of detection was 0.5 ng/mL in human urine. In the autopsy case, the concentrations of MPHP in urine, plasma, and liver tissue samples were determined to be 60.1, 32.9 ng/mL, and 63.1 ng/g, respectively. The new designer drug 4′-methyl-α-pyrrolidinohexanophenone (MPHP) is a synthetic cathinone classified as an α-pyrrolidionophenone derivative (see reviews ). MPHP was first identified in seized products as a drug of abuse in Germany in 2000 . In Japan, MPHP has been detected in many types of seized products including mixed dried plants called “herbs,” powder-type products called “bath salts,” and liquid-type products called “liquid aroma” because it was first identified in distributed illegal products in 2013 . MPHP is presumed to exhibit stimulant effects and serious toxicity like other synthetic cathinones and amphetamines . There is only one report on acute poisoning with toxic liver damage and rhabdomyolysis after MPHP intake . In this poisoning case, MPHP was found at a concentration of 100 ng/mL in the patient’s serum by gas chromatography–mass spectrometry (GC–MS), while it could not be detected in urine because of its metabolism , which is consistent with the findings in a study on MPHP metabolites in rat urine . MPHP could not be found in rat urine 24 h after administration with either 1 mg/kg, which corresponds to the common dose of abusers, or 20 mg/kg by GC–MS with a limit of detection of 100 ng/mL . Conversely, the main urinary MPHP metabolite 4′-carboxy-α-pyrrolidinohexanophenone (4′-carboxy-PHP) could be detected in both human and rat urine after MPHP administration. Therefore, to date, the toxicological detection of MPHP in urine by GC–MS seems to be possible only via its metabolites, including 4′-carboxy-PHP, but these compounds are not commercially available . Recently, Minakata et al. reported that a matrix-assisted laser desorption ionization-quadrupole time-of-flight-mass spectrometry enabled the sensitive quantification of MPHP with a range of 2–100 ng/mL, although the samples used consisted of blood from volunteers with MPHP added as a reference. In the present study, we are the first to identify and quantify MPHP in human postmortem urine by using liquid chromatography–time-of-flight-mass spectrometry (LC–TOF-MS) in an autopsy case. Chemical and physical properties of MPHP include a heavy atom count of 19, topological polar surface area of 20.3, covalently bonded unit count of 1, feature 3D acceptor count of 1, feature 3D cation count of 1, feature 3D hydrophobe count of 1, feature 3D ring count of 2, and effective rotor count of 7.